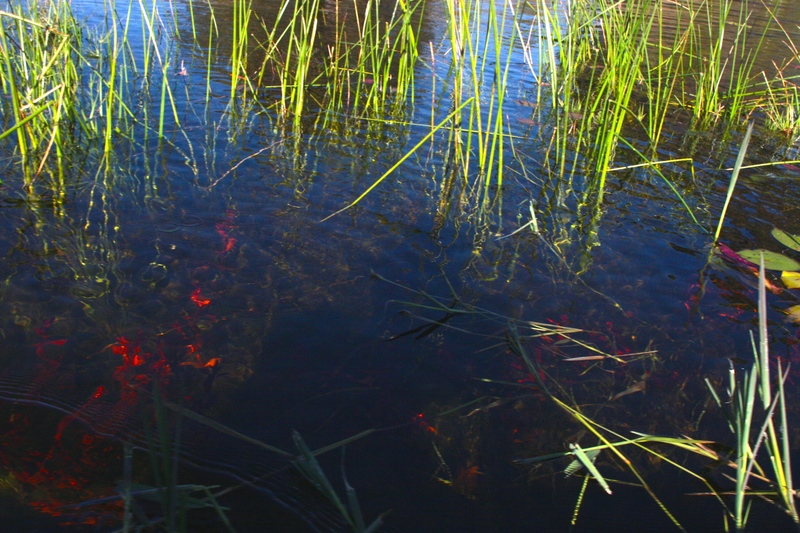 The Okavango Delta is one of the stars of southern Africa. A beautiful, unspoilt wetlands, slow waterways glimmering in the sun, alive with mangroves, insects and crocodiles, covering thousands of square kilometers. 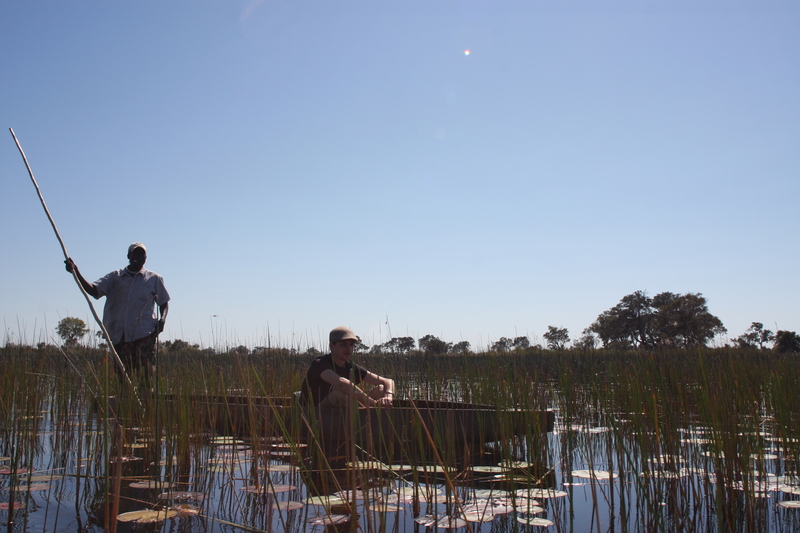 It is the terminus of the Okavango river, where the water fans out and eventually evaporates. 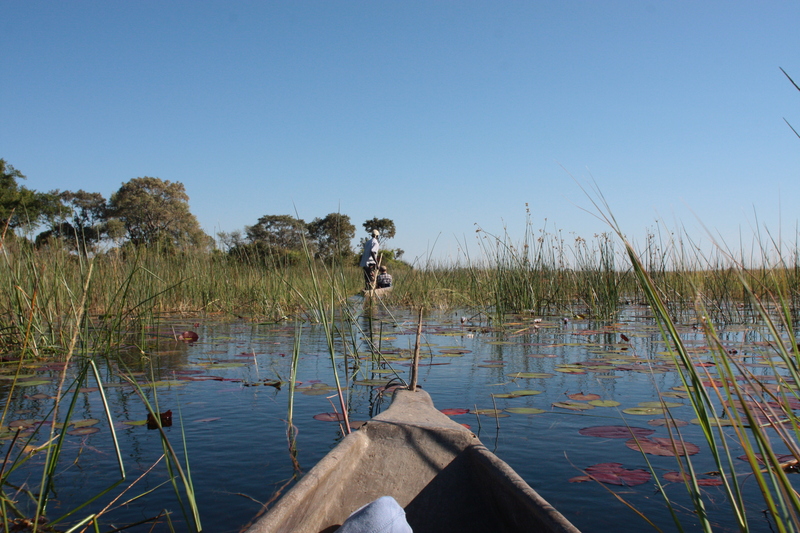 We travelled by speedboat along one of the many rivers to the ‘buffalo fence’, one of the entry points to the Okavango. So early in the morning, the air was ice-cold, and our faces stung in the wind. But it was too much fun to worry about. The buffalo fence was less of a fence, and more of a small island, where lots of guides and a few tourists were milling around. 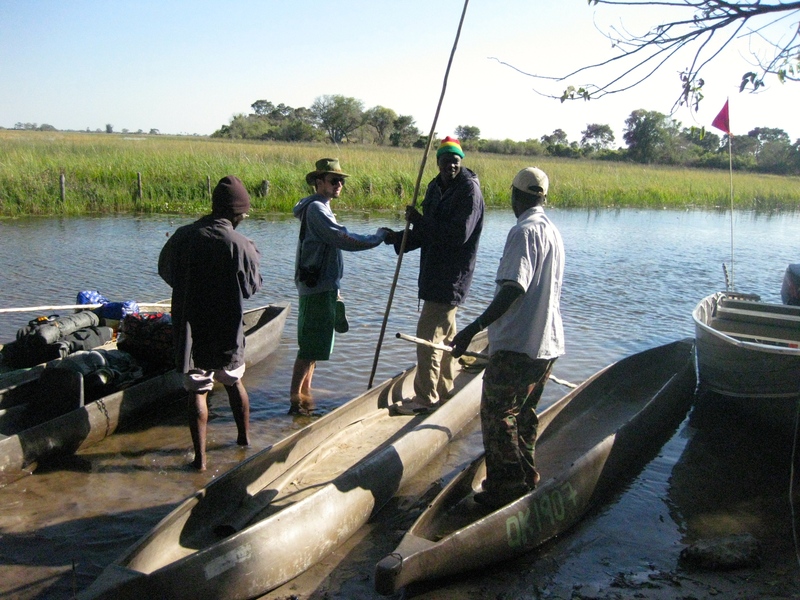 We waded ashore and inspected our two mokoros, a type of long, slender canoe. We would sit in the front of the mokoro, whilst the guide stood behind and controlled the speed and direction with a long wooden pole. Wessel, eager for a more authentic wooden one instead of fibreglass, tried to haggle (to his disappointment, unsucessfully). 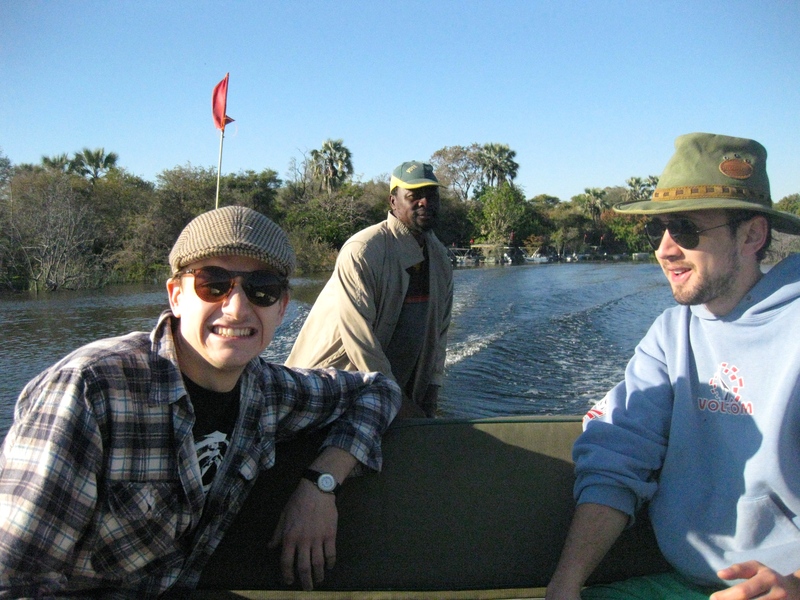 We boarded the mokoros and pushed off into the glassy water, Wessel and myself sharing one, and Jeff on his own in the other. It had been cold that morning, but by now the midday sun was beating down ferociously. 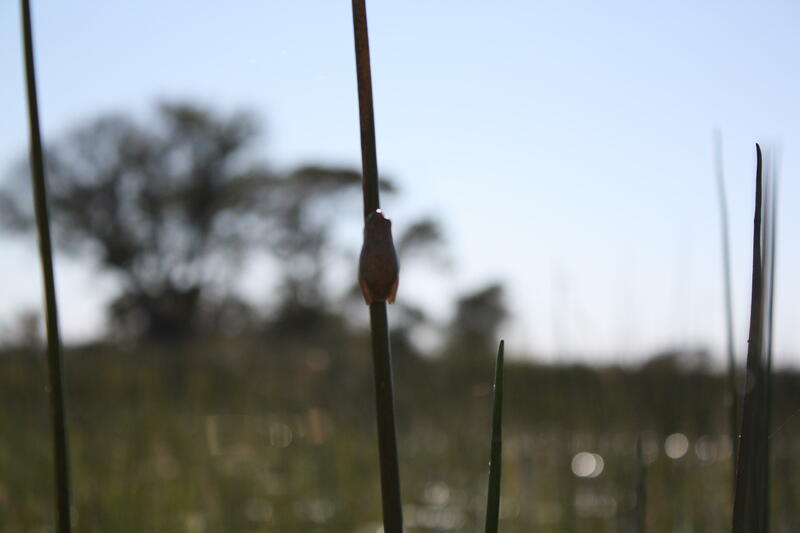 The wetlands were calm and still, and so clear that we could see the thick red and green roots of the reeds spiralling and intertwining beneath us. As we drifted through, we were enveloped by millions of dry grassy reeds, forming a surreal grassland around us. It was getting itchy. Tiny, long-legged spiders were crawling onto the boat, down our necks, into our sleeves. Wessel frantically tried to crush one with his shoe, in a torrent of swearing and bashing. I asked the guide what they were. The guide, a tall local with a jovial attitude and colourful Rastafarian beanie, laughed. “Water spider“, he replied in a deep voice, thick with African accent. He assured us they were harmless. Harmless, indeed, but they were itchy and irritating, and they were swarming everywhere. Eventually I couldn’t be bothered to chase them away, and I let them spin their webs on me. The guides posted some leafy branches on the front of each boat, to catch any spiderwebs we were heading into. Winter was not the best season for spotting wildlife, and we accepted that we probably wouldn’t see any crocodiles or hippos today. Our guides had a plan, however, and were leading us towards of one of the larger islands. The two guides told us to stay in the boat as they jumped ashore, finding high ground and standing aloft like meerkat sentries for a few minutes. Excited, we joined them ashore. They were on the lookout for elephants. The guides knew the trails and led us through the bush and brittle yellow grassland, following comically oversized piles of elephant dung and keeping a keen ear open for trouble. Lions hunted here too. 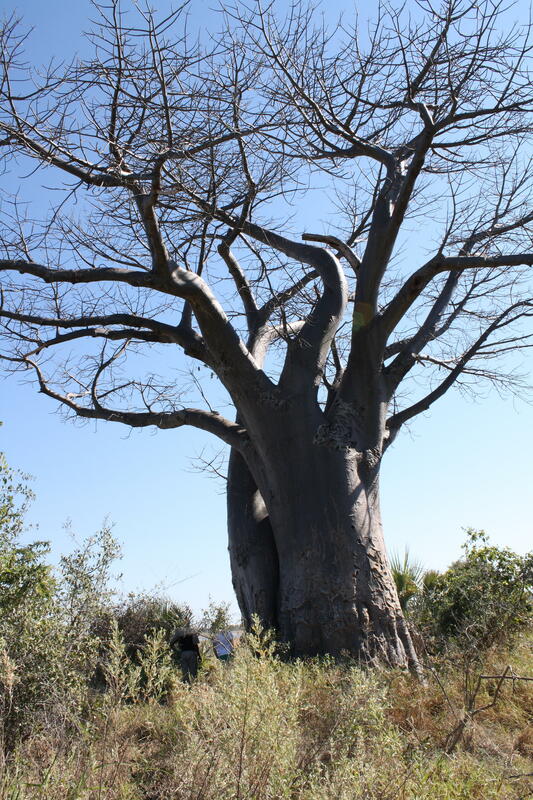 The guides showed us a giant Baobab, an iconic African tree with a wide, swollen trunk filled with stored water, and short, leaf-less branches that more resembled roots. They look almost as if they’d been planted upside-down. 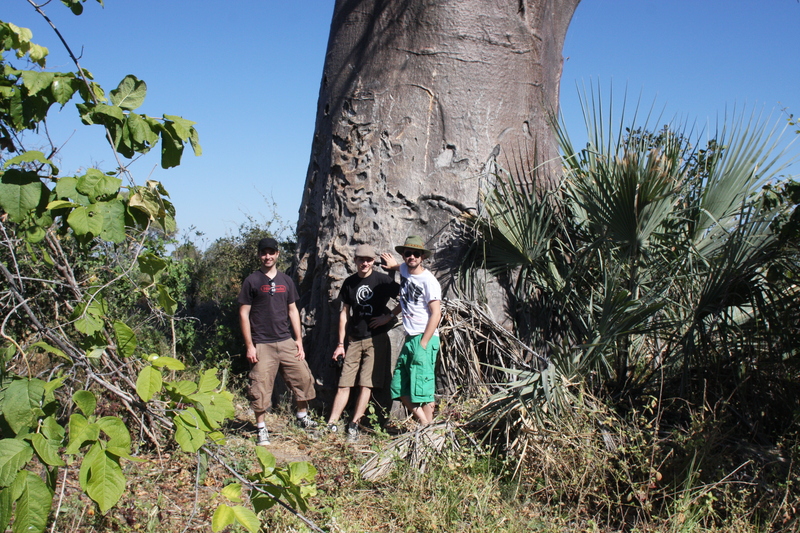 The guides felt disappointed that we hadn’t seen wildlife, except for frogs and insects. But to be honest, we were having a great time, in the middle of nowhere, walking across an island in a delta, tracking elephants. After about an hour of walking the trails, and headed back down to the buffalo fence. 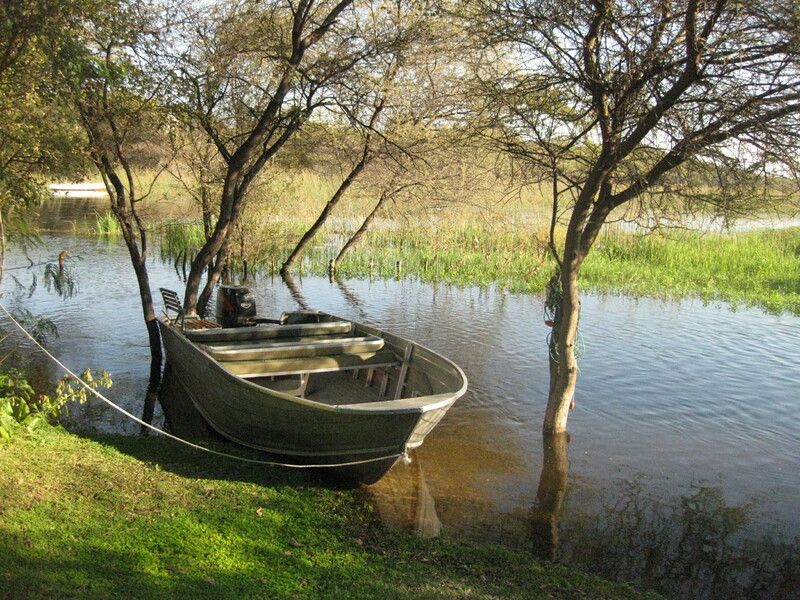 We arrived back at the campsite in the afternoon, packed, and drove quickly to the other side of Maun to find some lunch. We found a fancy hotel restaurant, which, despite appearances, had very cheap food and lazy service (this is Africa! ), and we drank beers and ate hot chips by the side of the pool. Wessel and I had gotten extremely sunburnt on the water. To keep the sun off my skin, I was wearing a black hoody. 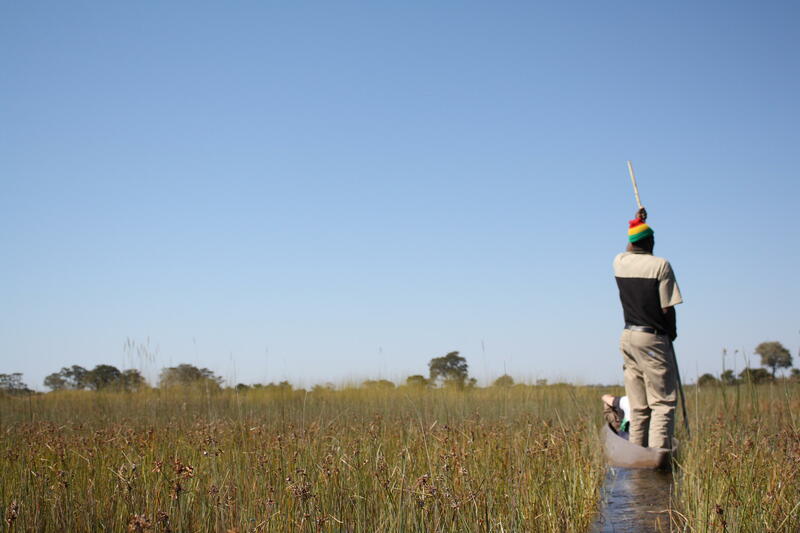 The Okavango Delta was great, but soon our minds returned to the prospect of a long drive to reach a game lodge to sleep in the Chobe National Park. We started the car, and drove relentlessly for hours, reaching the gates of Chobe at sunset. Then we saw the problem. There wasn’t anywhere to sleep for hours in any direction.